I decided to branch out and read a little YA. 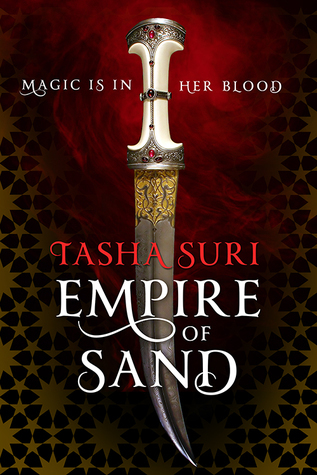 ‘Empire of Sand’ is a solid YA novel about a young woman coming of age in an extremely repressive culture. Now I’ll be blunt: I was not the target audience for this novel. This book felt focused on the female YA market. This book was quite good, as a fellow author I can recognize quality when I see it, but this book wasn’t for me. If you are in the female YA audience, then this is a Highly Recommend. Mehr is the illegitimate daughter of an imperial governor and an outcast sorceress. Born with her mother’s magic but raised in a pseudo-Mughal India court where magic is banned, Mehr stands out like a lotus amongst roses. Her step-mother hates her, and has turned her family against her. One day Mehr goes too far with her magic and shames her family, so they force her into a marriage she doesn’t desire with the emperor’s servant. The story unfolds from there, with Tasha being sent to the emperor’s palace in the desert with a husband she doesn’t love. Not all is as it seems, for her husband is a fellow sorcerer who has been enslaved- and now she has been enslaved by proxy. Plot: The story was a fusion of the plots of ‘City of Brass’ and ‘The Hundred Thousand Kingdoms.’ The emperor is using magic to enslave the gods of the desert, and in turn is using the gods to expand his empire. To do this he has to find sorcerers from the local population of nomads and bend them to his will. Mehr is just the latest in a long line of slaves, slaves who he works to death sustaining his empire. Characters: Mehr and her love interest had zero chemistry, as far as I’m concerned. Here’s why: Mehr and Amun were forced extremely unwilling into this relationship, and while married they were forced into slavery. Those are not conditions for a happy, healthy relationship Now of course everyone has different opinions about art, but for me their love did not do it’s job propping up the plot. This wasn’t the first book I’ve read with love interests with little chemistry, so I don’t hold it against the book. I liked Mehr as a character- reading about her we realize she is a noblewoman who was raised in a viciously backbiting court where you had to manipulate everyone to survive. We see her use this ability to lie and manipulate once or twice, which made her more memorable than your average YA protagonist. If anything, I wanted her to do it more often. I did not like her love interest Amun. He’s a classically Byronic antihero, who is moody and self-loathing. Except he isn’t a ‘bad boy’ that which trope so often entails. He’s a boring slave, because he doesn’t do anything which he isn’t told to do and he hates himself because he is a slave. Pacing: My biggest problem with this book was the pacing. The beginning was a pleasantly leisurely, the middle was far too slow, while the end picked things up. The book had very little action and a ton of dialog which contributed to the congestion of the pacing. Things picked up at the end when Mehr and Amun rebelled, but by then I was checking out mentally already. Setting: Strong. I liked the concept of sandstorms which bring magic and daeva wherever they roam. The author called the magic which occurs in sandstorms ‘dreamfire,’ and I envisioned this energy as brightly colored like an arabesque mosaic of lapis and topaz and carnelian. The concept of dancing in such a sandstorm of colors was just a really striking vision. Prose: On the stained glass-to-crystal clear spectrum of prose, this book lies slightly on the stained-glass side. I enjoyed reading it for the sake of reading it. As mentioned, the pacing was slow and I was not sold on the interpersonal relationships between the two protagonists. Also, I think the main character could have gone through more try-fail cycles as she basically started the book amazing. Net total, a solid book and a worthy debut. I Recommend this for your average Fantasy genre reader, but if you are in the female YA audience then this is a Highly Recommended. While I was able to point out multiple flaws above, a less well read reader (aka someone who isn’t a jaded jerk like me) will see a strong, cohesive whole. I might check out the sequels if the reviews for it are positive and/or it’s significantly shorter (because shorter books by necessity have to be better paced).